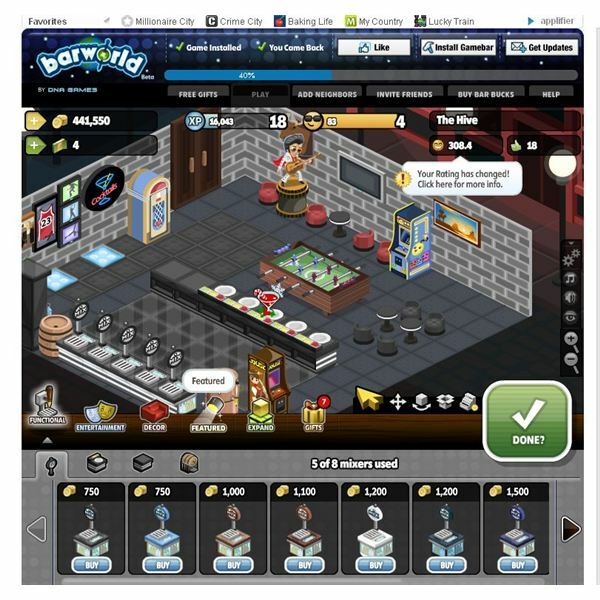 In Bar World you’ll be running your own bar and serving drinks to your guests. You have an area to make drinks and counters to place your drinks on. Your bar can also be fully decorated with various items such as tables and chairs. You also have interactive items such as arcade systems and pool which will generate you money over time. 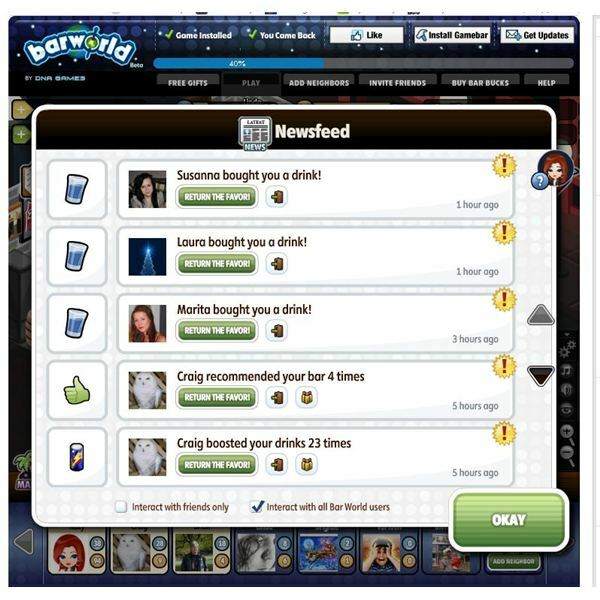 In the game you can visit other Facebook players in the game and help them run their own bar too. Follow the quests to learn more about the game. Bar World has a whole host of different drinks you can serve to your guests. Drinks take game time to complete and once they have completed you can add them to your countertops so they are ready for your guests. In addition to regular drinks you can build wine and beer casks to place in your bar. You’ll need to add ingredients to each drink before it is ready to serve. 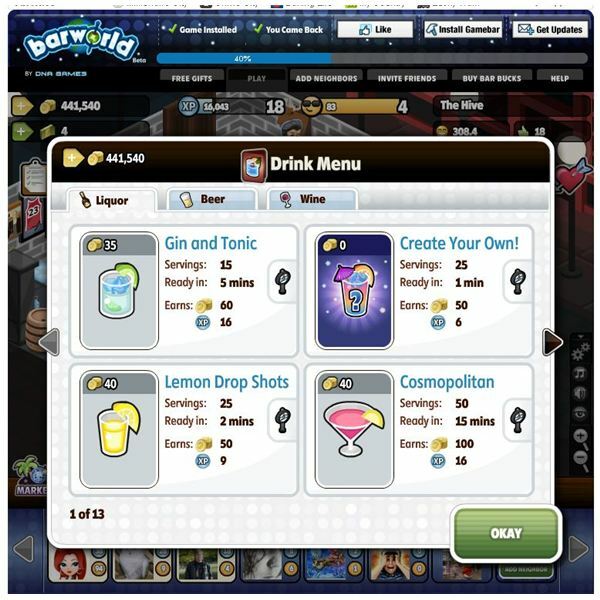 As you level up in the game more drinks will become available and you’ll be able to make more money for your bar. The game has dozens of different drinks you can choose from so you’ll always have something different to serve. You can add more counter tops and drink mixers once you reach the required level for your bar. Having decorations in your bar is important because it raises the happiness of your guests. You can also raise the happiness of your guests by making sure you have enough drinks to serve, performing bartender tricks, or by playing matchmaker in your bar. The main way you’ll raise happiness is by adding different decorations to your bar. The marketplace is where you can buy various items for your bar. Under the function section you can buy counters, drink mixers, beer casks, and wine casks. The entertainment section features arcade systems pool tables and other money makers for your bar. The décor section has drink shelves, tables, chairs, wall décor, plants, dividers, and many other decorations for your bar. Some decorations will only add experience while others will add both experience and happiness points to your bar. In the game you can add friends to be bartenders or bouncers for your bar. You’ll gain access to more slots as you level up. In addition to being able to visit Facebook friend’s bars you can also visit random Facebook users. On the news feed tab you can see who has visited you and you can click on their name to go and visit the bar they own. You can boost drinks,and train their bartenders. You also have the option of only visiting Facebook friends by click on the check boxes at the bottom of the news feed screen if you don’t want random visitors. Making an income in Bar World is very easy. The fastest way to make money in the game is to have a constant supply of drinks to serve your guests. You’ll want to have all your countertops full to maximize your revenues and keep the cash flowing in. It’s better to serve drinks that have many servings so you will continue to make money even if you’re sleeping. Only serve drinks with a small serving size if you’re playing and want drinks made quickly. The other way you can make steady income is to have plenty of entertainment items such as pool tables and arcade systems. These will generate money slowly over time and once they are full you can collect your money from them by clicking on each machine. Entertainment systems will also help to increase the happiness of your guests in the bar too. You can expand your bar via the expansions screen. You’ll need Facebook friends or game cash for each expansion. Adding more neighbors is the easiest way to expand your bar especially if you don’t want to spend game cash to do it which can get expansive. In the game you can also move your bar to another location and have a different backdrop theme. You have downtown, beach, mountain top, saloon, and skyline themes. You can unlock each of these locations as you level up in the game. 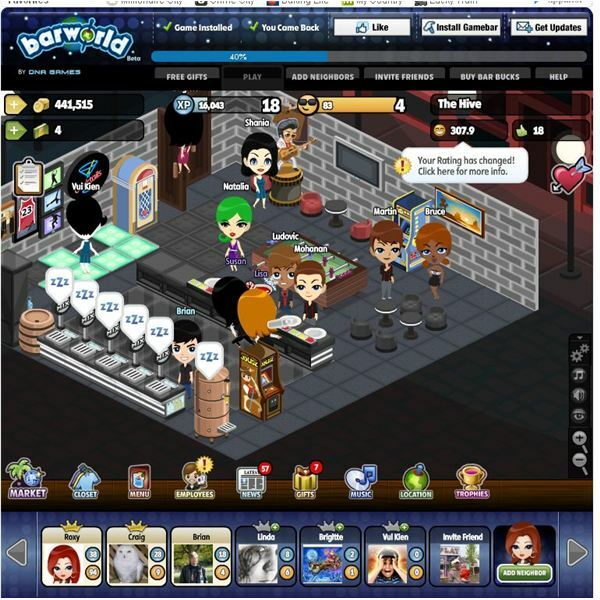 In Bar World you can use the avatar customization tool to change the look of your avatar. You’ll find different facial features and different sets of clothes to try. Many of the features do however cost game coins so save up if you plan to change your look often in the game. On the music tab you can change the music in your bar to a different genre such as rock, pop, modern, or electronica. Bar World isn't very complicated and you'll get the hang of it in no time. Be sure to keep your counter tops stocked with drinks and use entertainment items such as arcade machines to keep the money coming into your bar.